Once again, Einstein’s theory of relativity is confirmed by scientists. Next stop: Creation. Champagne bottles were uncorked in physics labs around the world this week when a team of scientists announced they had finally achieved a long cherished dream, detecting the elusive gravity waves predicted by Albert Einstein 100 years ago. This remarkable discovery, which confirmed the last major prediction of Einstein’s theory of general relativity and opens up a whole new way to explore the universe, will almost certainly merit a Nobel Prize in Physics. In 1916 Einstein himself didn’t believe these faint gravity waves could be detected in his lifetime. A century later, the devices that finally detected them are so enormous that they can be seen from outer space. 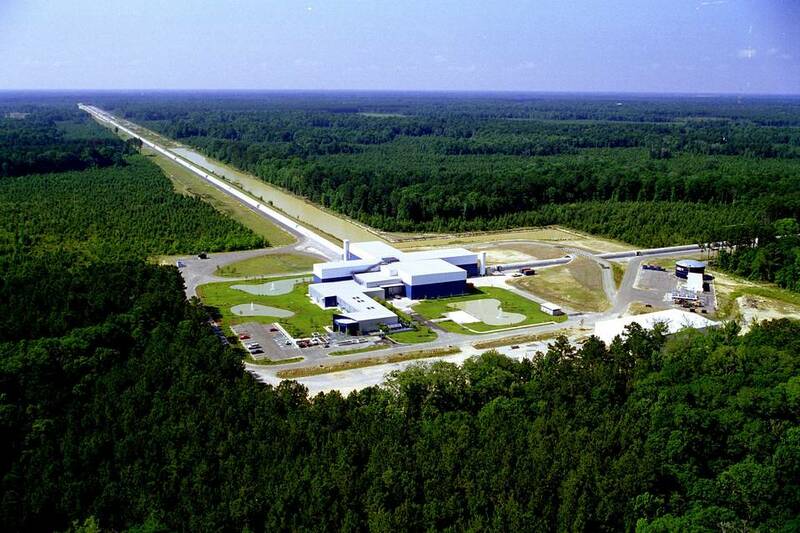 The two Laser Interferometer Gravitational-wave Observatories, or LIGO detectors, one in Washington state and the other in Louisiana, operate like massive horizontal antennas allowing scientists to detect the gravitational waves. On Thursday, in an article in Physical Review Letters with more than 1,000 authors, the LIGO scientists revealed that on Sept. 14 they had detected the collision of two black holes in deep space more than a billion light years away but it then took five months to analyze and confirm the results. The black holes were about 36 and 29 times the mass of the sun, and the colossal shock wave caused by their merging into an even larger black hole sent violent ripples of gravity hurling throughout the universe. Each LIGO detector consists of two pipes, each 2.5 miles long, creating the shape of an L. Each pipe contains a laser beam of light bouncing between perfectly positioned mirrors. If a gravity wave from outer space hits the L, it causes a tiny disturbance, which is then measured by analyzing how the two laser beams interact. As an added treat, the LIGO scientists have converted the gravity waves they detected to sound waves so one can hear the ripples in space-time that Einstein predicted. All this has once again confirmed Einstein’s theory of general relativity, which he developed almost entirely on his own between 1907 and 1915. Einstein’s great insight was to realize that space-time is not empty, but more like a fabric that can bend and stretch and cause the path of objects to bend, giving us the illusion of gravitational force. But if the fabric of space-time can stretch, thought Einstein, why can’t it also create ripples? Think of throwing a rock in a pond. Ripples will gradually radiate away from the splash and fill the surface of the pond. This is similar to what the LIGO scientists detected for the first time: Gravity waves rippling outward from the collision of two black holes a billion light years away. The LIGO discovery also answers a question commonly asked about the sun. Many people have asked a deceptively simple question: If the sun were to suddenly disappear at this instant, how long would it take for us to notice? Newton thought gravity acted instantaneously, so the earth would instantly be hurled into space. Einstein thought otherwise. If space is a fabric, then shock waves traveling along this fabric should take eight minutes to reach the earth, traveling at the speed of light. The LIGO breakthrough confirms Einstein’s hypothesis, and has profound cosmological implications. The next generation of gravity-wave detectors might be put into space, and might eventually be sensitive enough to detect the most revealing radiation of all, the radiation from the instant of Genesis. One can calculate that the next generation of space-based gravity wave detectors might eventually be sufficiently sensitive to detect gravity shock waves from the big bang. If true this, in turn, would open up an entirely new chapter in astronomy. Each time a new wave was discovered, it changed human history. When Galileo used light waves to create his telescope four centuries ago, it profoundly altered our view of the universe and even shook the Catholic Church. Then, around the time of World War II, radio waves were harnessed to create radio telescopes capable of detecting quasars, colliding galaxies and even black holes. Now we are witnessing the third great revolution in telescopes, the use of gravity waves to open a new chapter in astronomy. For the first time, waves from the very instant of creation might be observed, giving us “baby pictures” of the universe as it was born. High-school textbooks may have to be rewritten to incorporate the new discoveries coming from this third generation of telescopes. When Einstein postulated gravity waves a century ago, he not only opened up an entirely new chapter in astronomy, he also opened the door to answering the most important philosophical questions of all time, including the creation of the universe. Mr. Kaku is a professor of theoretical physics at the City College of New York and the author of “The Future of the Mind: The Scientific Quest to Understand, Enhance, and Empower the Mind” (Doubleday, 2014).